Although good writing is hugely important to me, I love wordless picture books too. They are an excellent way to encourage storytelling in kids, and somehow seem to be open to even more layers of meaning than a traditional children's picture book. So I picked up The Bicycle, Colin Thompson's latest project in support of Save the Children, with anticipation. It's beautiful! Published 2011 by Harper Collins, it features work from Quentin Blake, Tony Ross, Ruth Paul, David Legge, David Miller, Michelle Pike, Freya Blackwood, Jan Bowman, Kim Chatel, David "Dub" Leffler, Sarah Davis, Gabrielle Wang, Colin Thompson, Jack Story and Shaun Tan. In 2008, Colin Thompson visited Cambodia with Save the Children. 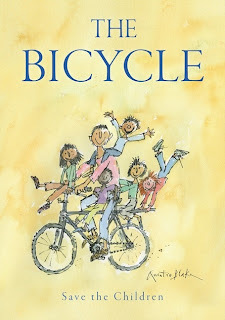 Struck by the way the humble bicycle was central to so many people lives, he was inspired to create THE BICYCLE, his second picture book for the charity. 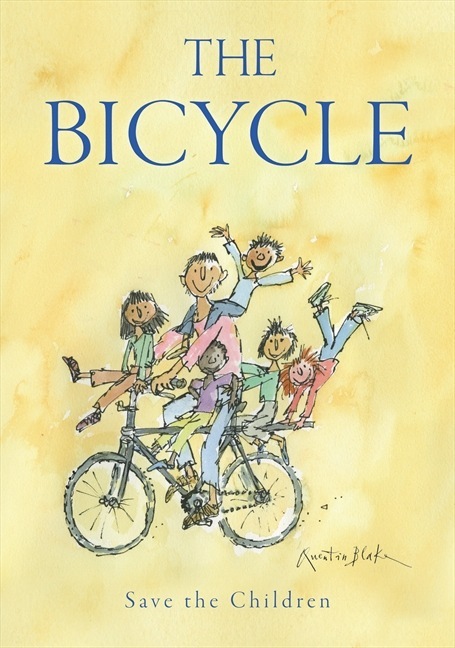 THE BICYCLE features separate illustrations from internationally acclaimed artists - including Quentin Blake, Shaun Tan, Tony Ross and Freya Blackwood - which celebrate the liberating joy of two wheels. Sprinkled throughout are delightful quotes from famous people, as well as quotes from Cambodian children such as 14-year-old Dany, who describes his bicycle as his ′best friend′. I loved the opportunity to see how each artist had interpreted the bicycle in his or her own way. There are so many techniques and artistic styles to admire! It's great to imagine children all over the world poring over these illustrations and sending their imaginations soaring. And the very few quotes added to some pages certainly gave me pause for thought. My favourite is probably a quote from Colin Thompson himself: "To many people, a bicycle is the key to their greatest dreams." When Save the Children give a child a $50 bicycle, it means they can get to a school, learn to read and write. By buying this book, we help Save the Children put the power of literacy and literature into deserving children's hands. One double page illustration has special meaning for me. It's a whimsical sailing bike, ridden by a young cycliste and her duck, across the sea past a friendly sea monster. This picture was created in felt by fibre artist and author, Kim Chatel. Kim is my friend, and I'm so pleased to see her work gaining recognition in this way. I believe school librarians in particular will love this book. It's a perfect resource for a unit on transport. It obviously supports the visual arts curriculum. But I think it also makes a wonderful model for children's own creativity. Teachers could encourage kids to respond in writing or art to any page in The Bicycle, or even to collaborate on the design of a different humanitarian project. I hope you'll look out for The Bicycle. All the royalties from the sale of this children's picture book are donated to Save the Children. Isn't it fantastic for kids to see adults contributing to such a project? To me, The Bicycle is not only a testament to human creativity, but also a reminder of humanity's need to be compassionate and offer a helping hand to others. Find more Children's Book Reviews on www.thebookchook.com by clicking on the Reviews button at right.